Check the yahoo message boards for NYSW/Susquehanna. It was posted over there numerous times over the course of the year. They started cleaning/clearing the soil near the switch off the main probably close to a year ago or more and now are just near essex street crossing. Ties, rails (and all the equipment that removed them) are gone from the branch, Essex Street back up to the main line. Looks like it may be done for good, although there still has been no filing for abandonment. Its been a year and a half since the removal, and I can't imagine why they would replace the rail since there are no customers left. A formal filing is not necessary for industrial tracks and tracks in yard limits, although I don't think the Lodi branch would qualify. On another note, the Passaic branch is still stuffed with CEFX gondolas. These cars, owned by Capital Leasing, were used in removal of dirty dirt from the brownfields (Superfund) cleanup at the former Maywood Chemical Company. Presumably that project has been completed. These relatively new cars have been stored here for a long time. The Garden State Paper complex in Garfield, the line's major customer in later years, has been totally demolished and new condos built in its place. riffian wrote: Ties, rails (and all the equipment that removed them) are gone from the branch, Essex Street back up to the main line. Looks like it may be done for good, although there still has been no filing for abandonment. Its been a year and a half since the removal, and I can't imagine why they would replace the rail since there are no customers left. A formal filing is not necessary for industrial tracks and tracks in yard limits, although I don't think the Lodi branch would qualify. the maywood superfund site is far from done. Its been reported that it will take atleast another 5 years to get it cleaned up. They recently built a loading crane of sorts along the siding. I can still remember vividly watching trains cross Rt. 17. The day I went for my drivers license test in Lodi I recall the Hoboken Paint plant being switched by a GP18. Still real neat thinking how much industry was packed into that side of town opposite of RT 17. It has to be tough starting up an industry these days in NJ. That crane you are referring to at the superfund site looks like a fall protection device for workers on top of the gondolas. I have seen them advertised in trade magazines. Was scouting the Passaic Branch a few weekends ago and the branch is alive, with stored cars! They are parked all the way up to RT 46. If I had to guess the ground is too hard to be digging right now so these cars are stored until things soften up. I am not very familar with the process of extracting tainted dirt, so this is my educated guess as to the amount of cars stored on the branch. i didn't see any cars on the passaic branch last thursday when i was in the area. They keep them on their and the lodi when it was connected for storage for that superfund site. There are new ties laid down north of Essex St. Line is starting to go back in. Angus202 wrote: There are new ties laid down north of Essex St. Line is starting to go back in. Passed by tonight, there was a backhoe by the Essex st. crossing. I dont know if it's for the susy-Q or something else, but it was parkedalong the tracks. Brand new ties laid from where they ripped up the track near essex street for as far east or west, whatever direction it is that I could see. Steve F45 wrote: i didn't see any cars on the passaic branch last thursday when i was in the area. They keep them on their and the lodi when it was connected for storage for that superfund site. In the interest of not starting another two reply thread. Does anyone know the last time a train crossed RT. 46? As a long time Bergen County resident who grew up in Southern Bergen County, I've witnessed traffic on they NYGL dry up, I've watched the last train ever roll over the lengthy industrial spur to Two Guys in Garfield, and seen long slow decline of freight on the PVL and BCL. With the Lodi Branch OOS for a while now, freight rail servicing(not simply running through) Bergen County is hanging on for dear life. Well I don't know when a train last crossed route 46, but I agree individual freight customers are few and far in between in bergen county. In other threads the amount of customers on lines in years past was impressive now dwindled down to a precious few. As an example, the CSX northern branch once had 3 different trains servicing customers 5-6 days a week. and now, not much left. The NYSW lodi branch nothing left. The PVL line hasn't seen a freight through westwood station in over 20 years! 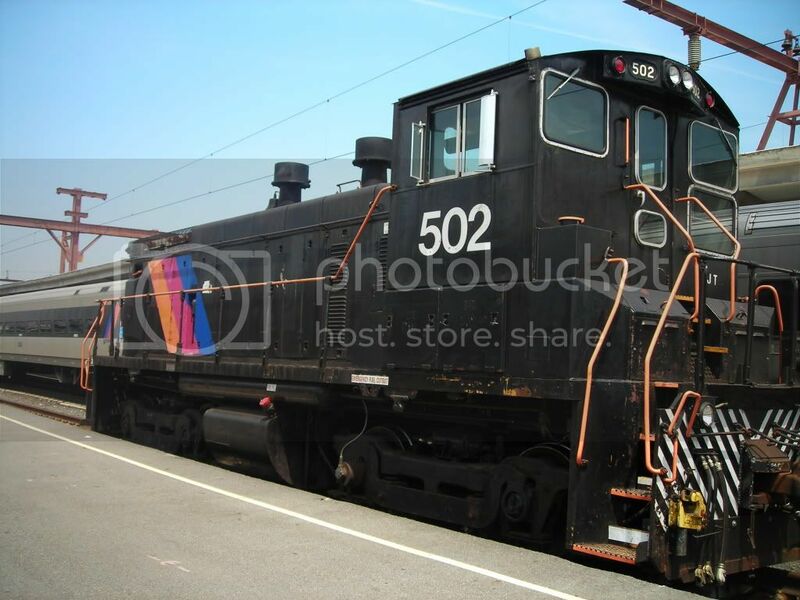 Well being a member of Elmwood Park I can say that the last time was in 2010 when NS GP38-2 #5293 took cars out of storage from the Garden State paper side of RT. 46. I haven't seen cars on that side of the branch since. I grew up in EP and lived right off the Boulevard by the crossing. In 2001 I witnessed the last paper train to ever leave the plant. The scanner was on and I remember hearing the crew say this would be their last time running across "crazy RT 46". Which surprised me since the crossing was recently protected with overhead signals to stop motorists. It was a crappy day and I did not photograph it. At the time it was unknown to me that Enron closed the plant up. As Sean said in a previous post, the last time a train crossed 46 was to retrieve stored trash cars in 2010. Working for a industrial company now, I can realize why so much industry is gone from Bergen. Besides the noise or possibility of pollution no township wants to deal with the problems near dense residential areas. Most manufacturing is outside the country or in another part of the country where the population density is sparse. Its neat looking around and seeing what industry remains in this dense county and how they survived. It would also be neat to see some more industry rebound and ship by rail using the Susie-Q branches. airman00 wrote: Well I don't know when a train last crossed route 46, but I agree individual freight customers are few and far in between in bergen county. In other threads the amount of customers on lines in years past was impressive now dwindled down to a precious few. As an example, the CSX northern branch once had 3 different trains servicing customers 5-6 days a week. and now, not much left. The NYSW lodi branch nothing left. The PVL line hasn't seen a freight through westwood station in over 20 years! Yea, going to HS in Hillsdale, the closest thing to freight I got to witness was watching the rails of an old siding to Waste Managment in Hillsdale slowly emerge out of the crumbling pavement. I did witness though a freight train pass through Hillsdale in the late 2000's, but it was a Kuiken Brothers Emerson freight going to the Nanuet siding so the engine could run around the train. I don't necessarily think losing light industry overseas honestly had much to do with the decline of non-containerized freight; that villian would be trucking. In terms of gross tonage hauled by rail, I think it is actually currently higher than it was in the "golden ages" of American railroading. The traffic has just all moved to massive consolidated port facilities and away from Lodi & Passaic Branch type railroading. The Susquehanna branches and spurs, however, do have a big advantage over the PVL's and BCL's of the world. They dont have to work around passenger schedules, and can drill the entire spurs during the day, and not after-hours, which is a contentious issue in affulent Bergen County towns.